The apartments with a magnificent view of the lake occupy the attic floor of a modern building, located in the heart of the city. Rare wood and marble, used in the design, combined with functional design solutions create an expressive and elegant interior. The Customer is a talented French financier. Having become the owner of the exclusive real estate by the Geneva standards (the modern infrastructure is combined with an ideal location on the city map), the owner wanted to convert the apartment in a city penthouse, by equipping the terrace on the roof, offering a perfect view of the Leman Lake. The apartments are planned as the open-space; only 2 bedrooms and a small office are isolated. The Customer’s preferences coincided completely with the artistic vision of the studio designers. 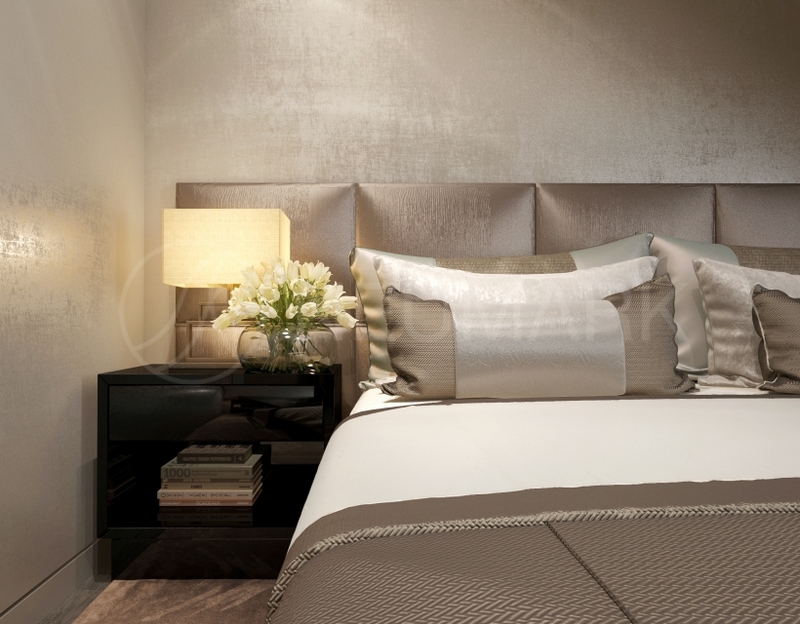 The basic interior color palette is warm beige and gray-brown tones, shades of silver and bronze. Decorative plaster, precious wood and stones, and rare types of skin were used in the decoration. 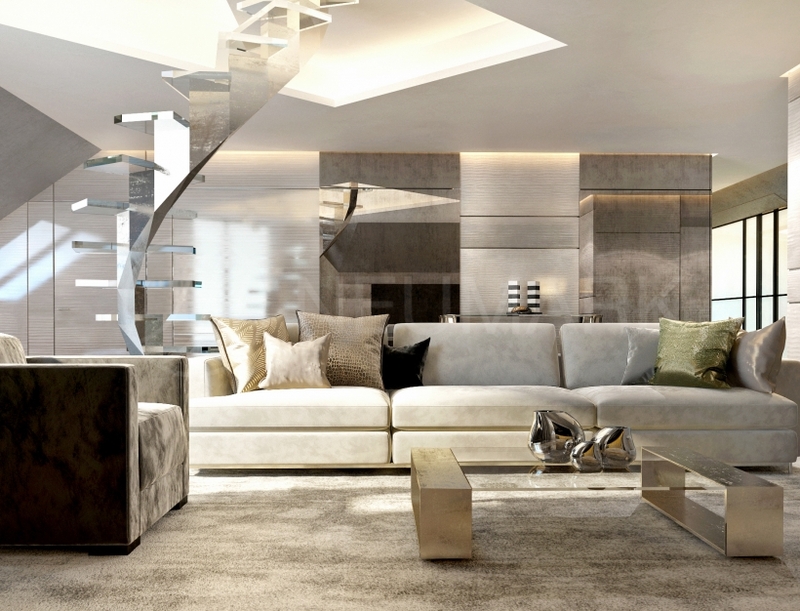 In the living room the attention is paid to the unusual staircase of polished metal with glass steps; the sun rays, reflected from its surface, fill the space with soft light. The staircase, which, at first glance, seems quite simple, in fact, is extremely complicated in execution - the designers were challenged to make it not only easy, but also as safe as possible. Here, right under one of the large windows there is a fireplace. 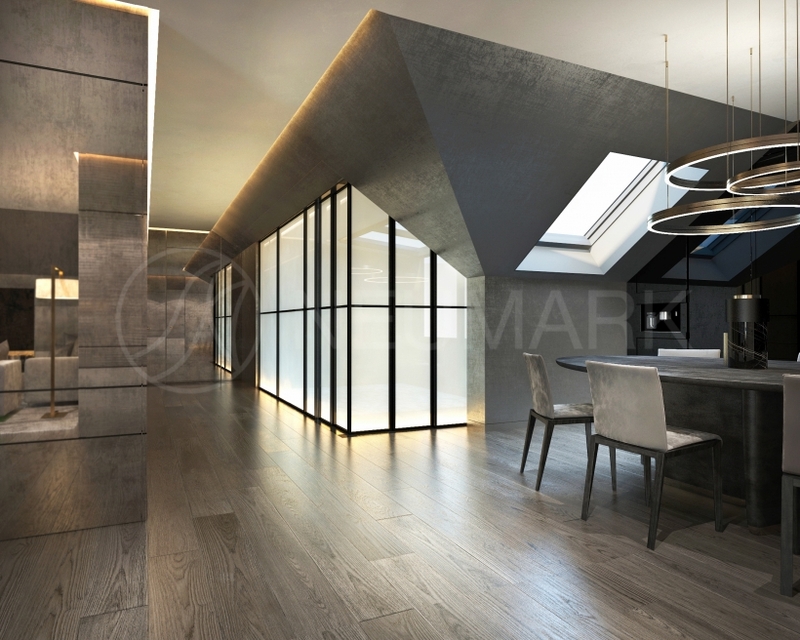 The kitchen is combined with the dining area; hiding its dark panels emphasizes the concise and correct forms of the interior. Above the table, upholstered in leather, there is a composition of the three ceiling lights. Along the corridor there are sliding panels. The wooden floors of the apartment are decorated with the silk hand-made carpets. 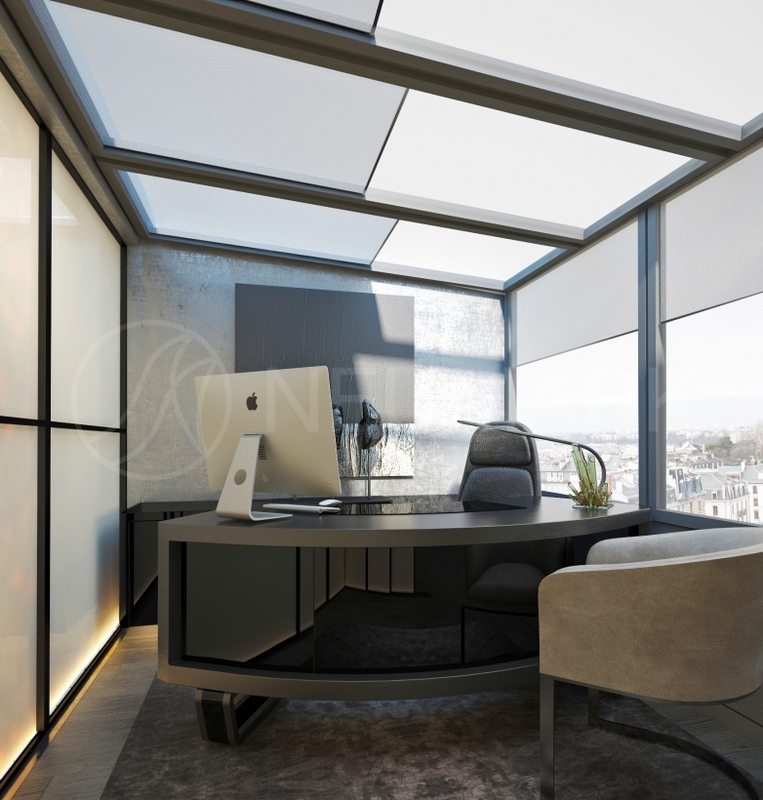 The owner’s office is located in the attic room, and due to its glass ceiling, is fully illuminated by natural way. 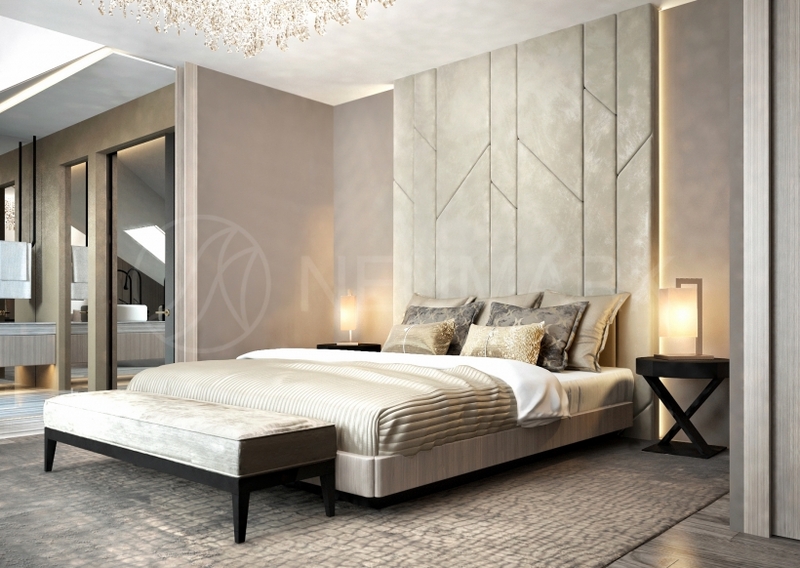 In the master bedroom there is a bed with high headboard of ivory-color leather, being in harmony with the upholstered banquettes. Lighting preference was given to the Italian producers. 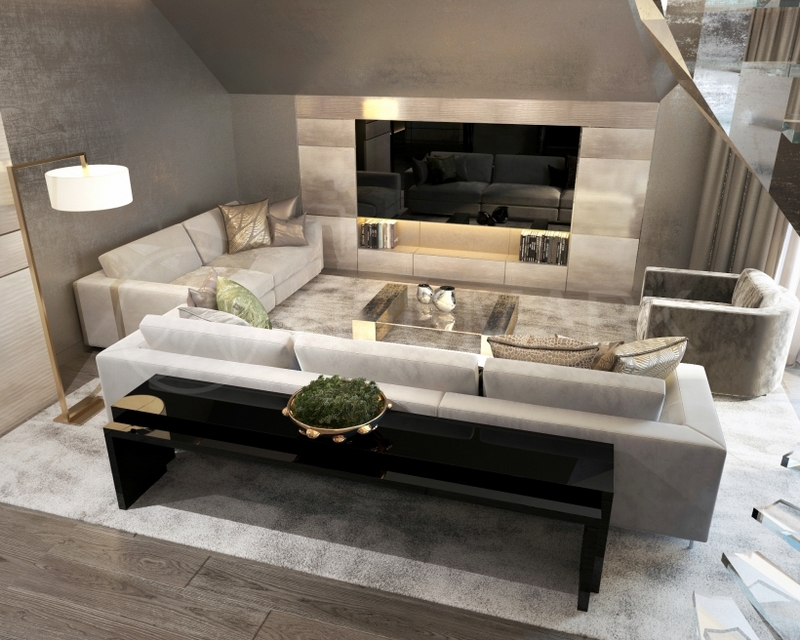 The living room, as well as the master bedroom, is sustained in soft golden tones. 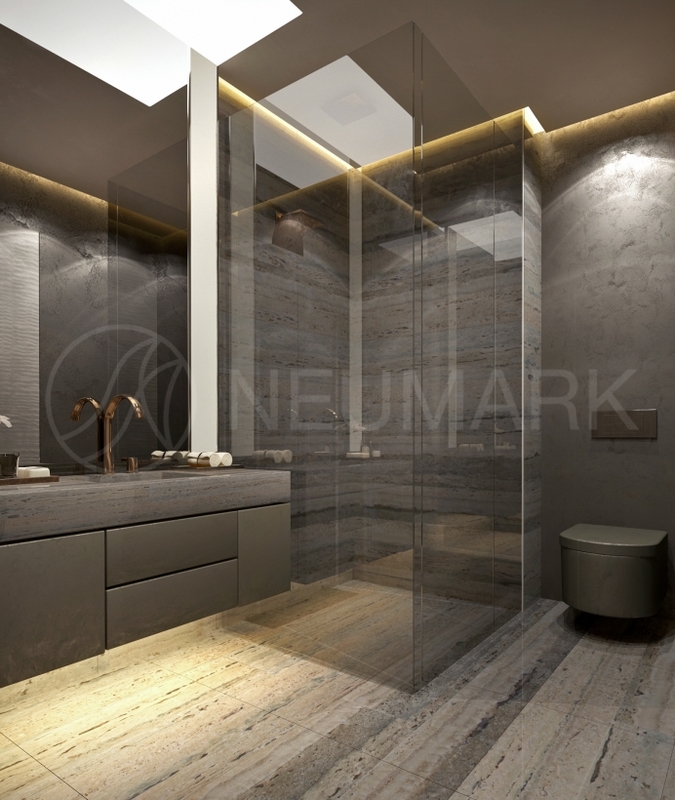 In the bathroom unusual marble with bright brightly marked contrast streaks is perfectly combined with the bathroom fixtures of “champagne” shade.